Today's cake is a real taste sensation, no less. You probably had chocolate raspberry truffles before; they are one of my favorites. 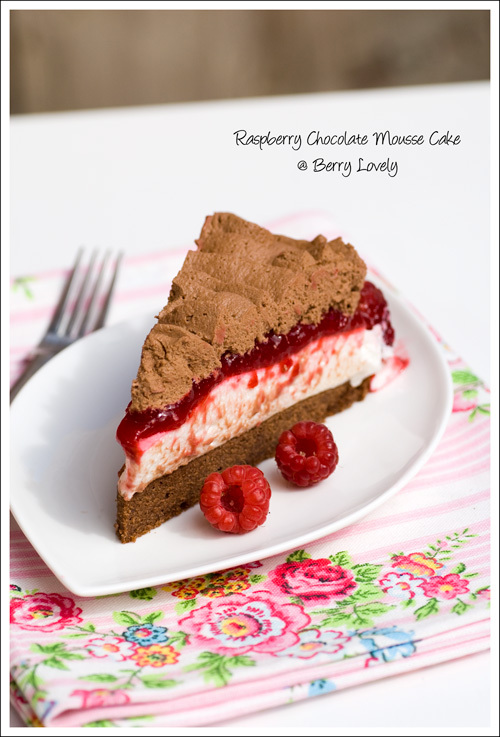 Raspberry and chocolate together is just heavenly. This cake tastes like a big version of it. The recipe also uses a yoghurt mousse, which creates a delicate balance in the acidity of the yoghurt, the sweetness of the chocolate, and the tartness of the raspberry. Since the berries looked so fresh and full of life, I also think that this cakes accentuates these beautiful little jewels. Piping the mousse took a bit of skill and lots of patience. I am still not yet fully satisfied with the results. Another thing that you need to keep in mind, is that the cake might take a while in the fridge to set, especially on a hot sunny day. I served it a little too early and the first couple slices went out of shape a little. After putting it back in the fridge, the rest was fine. Start with making the chocolate cake by melting the chocolate (50 g) over a water bath on medium heat. Preheat your oven to 180° C (350° F) degrees. Line a 22 cm (8.5-inch) round springform with parchment paper. In a bowl using a handheld mixer cream together the butter and powdered sugar. Add the eggs, one at a time and beat until incorporated. Whisk in the melted chocolate and then the flour. Fill the batter into the prepared springform and bake for about 15 minutes. Take out of the oven and let cool on a wire rack before removing from the pan. For the yoghurt mousse soak the gelatin in cold water. Split the vanilla bean lengthwise and scrape out the seeds. Heat the milk together with the vanilla seeds and the pod. Discard the vanilla pod. Dissolve the gelatin in the hot (not boiling) milk and stir until dissolved. Let cool slightly then whisk the milk together with the yoghurt. Beat the egg whites together with the salt until medium peaks form, slowly add the sugar and continue beating until stiff peaks form. Carefully fold the egg whites into the yoghurt mixture. Put the chocolate cake onto a cake plate and put a cake ring around it. Fill the yoghurt mousse on top of the cake and put in the fridge for at least 2 hours. To make the raspberry layer first soak the gelatin in cold water. In a saucepan cook the raspberries with the powdered sugar, then put through a fine mesh sieve to discard the seeds. Add the gelatin to the still hot raspberries and let dissolve. Let cool for a bit, then fill the raspberry sauce on top of the set yoghurt mousse layer. Put the cake back in the fridge for at least 1-2 hours until the raspberry jelly has set. For the chocolate mousse whisk together the egg, egg yolks and sugar using a handheld mixer. Beat for about 5 minutes until thick and foamy. In the meantime melt the chocolate over a water bath on medium heat. Fold together 1/3 of the whipped cream with the melted chocolate, then add to the egg mixture. Carefully fold in the remaining whipped cream. Put in the fridge for one hour. Before using whip the mousse with a handheld mixer to add volume. Fill in a pastry bag with a rose petal or St. honore tip. Starting from the middle of the cake pipe the mousse in a rose pattern on top of the raspberry jelly, leaving a rim. 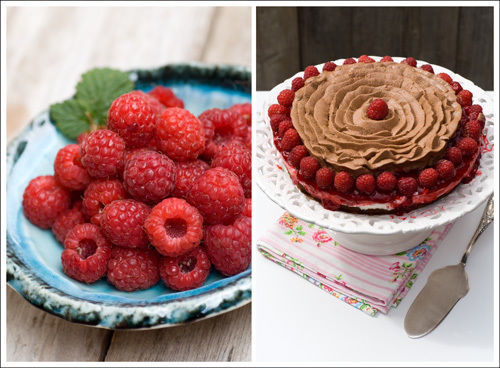 Decorate the rim of the cake with fresh raspberries. Keep in the fridge until serving and remove the cake ring just before.